Subject: Proforma for making transfer/ posting requests in respect of HAG, SAG and JAG officers. I am directed to enclose herewith Proforma for making transfer/ posting requests in respect of HAG, SAG and JAG officers with a request to circulate it in the Circles and all the concerned officers may be advised to prefer their transfer requests in the prescribed format from now onwards. The requests' if any,’ at present may reach the Directorate by 30th November, 2017. 2. The requests may also be e-mailed to dopspg[at]gmail.com. 3. This issues with the approval of Member (P). 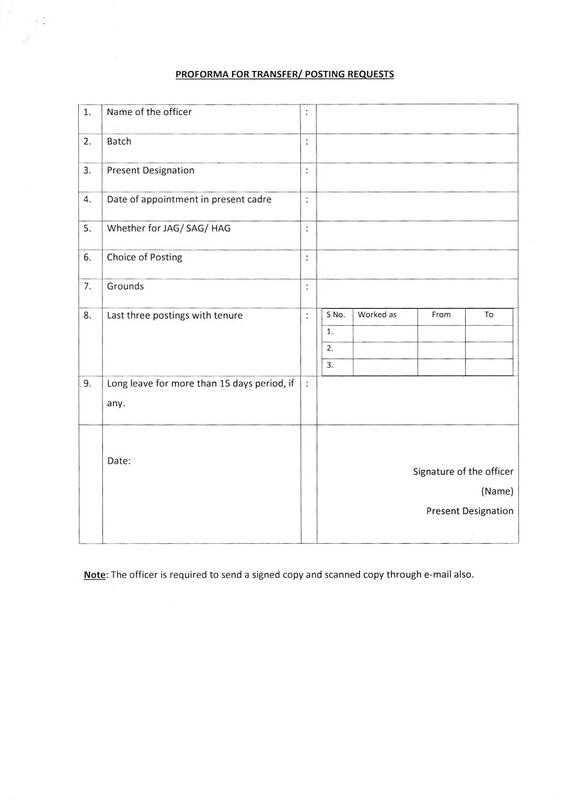 Deptt of Posts has issued proforma for making transfer/ posting requests in respect of HAG, SAG and JAG officers with advised to prefer staff transfer requests in the prescribed format from now onwards.